See calendars for holiday hours and for extended hours during exams and bar study. If you have a book suggestion, please contact the Law Library here. 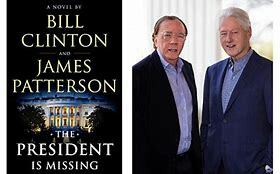 The President is Missing - written by President Bill Clinton with James Patterson. From Amazon: The President Is Missing confronts a threat so huge that it jeopardizes not just Pennsylvania Avenue and Wall Street, but all of America. Uncertainty and fear grip the nation. There are whispers of cyberterror and espionage and a traitor in the Cabinet. Even the President himself becomes a suspect, and then he disappears from public view. Set over the course of three days, The President Is Missing sheds a stunning light upon the inner workings and vulnerabilities of our nation. Filled with information that only a former Commander-in-Chief could know, this is the most authentic, terrifying novel to come along in many years. The President is Missing, call number PS 3603 .L56539 P74 2018, is located in the Legal Fiction collection, housed in the First Floor Reading Room. Sarita Kenedy East Law Library of St. Mary's University supports legal education and scholarship by providing outstanding service and information resources.